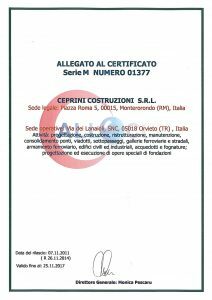 CEPRINI COSTRUZIONI SRL is a leading company in the field of civil engineering works with almost 40 years of experience. Thanks to a constant commitment of his founder, his far-sightedness to choice the targets to follow and his capacity to reach them, today the company has a great successes. 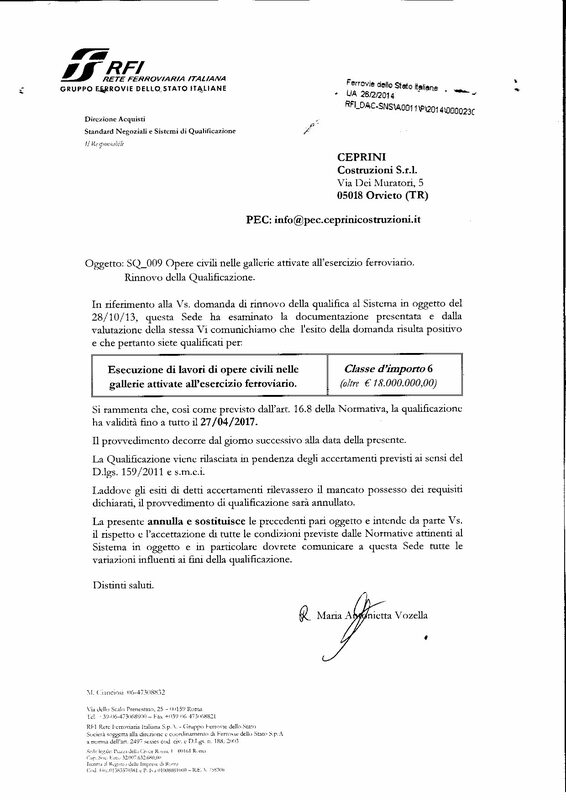 The founder, Franco Ceprini, is born in Città della Pieve (Perugia) on January 16, 1945. 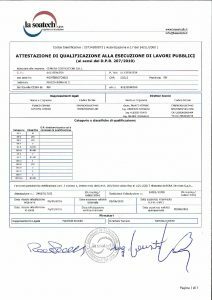 In the year 1964 – 1965 he obtained the surveyor degree at Technical Institute Lorenzo Maitani of Orvieto, in the July session. 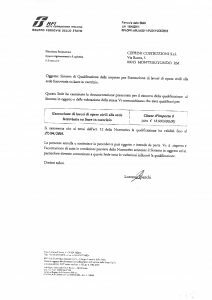 Immediately he found work in a company of Orvieto, specialised in roads, highway and railway sector where he will remain until 1976, first as technical employee and then as head of construction site and finally as technical manager. 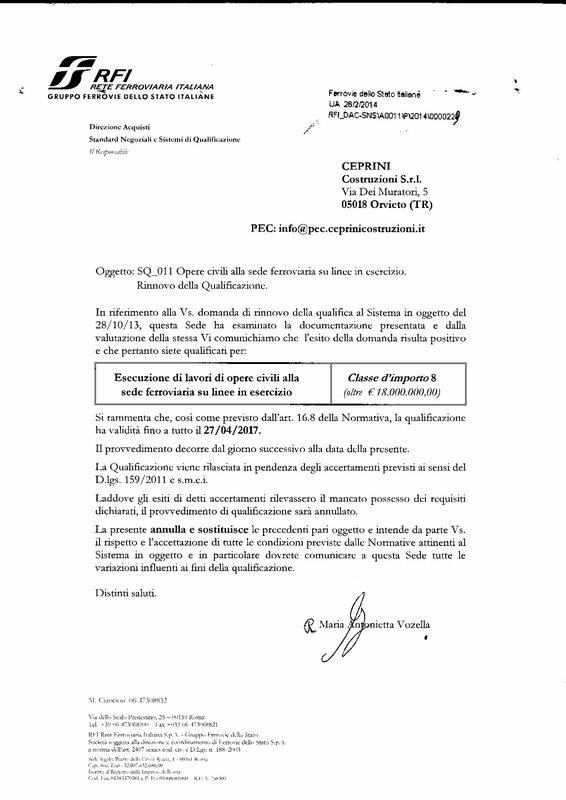 In that period he gains experience in the realization of different kind of works, among them railway construction (renovation and redevelopment of tracks, tracks construction, for example the realization of the first section of doubling on Bari – Brindisi line and the tracks construction of Florence – Rome high speed Railway between Rome and Orvieto) and consolidation works inside tunnels between Orvieto and Chiusi. 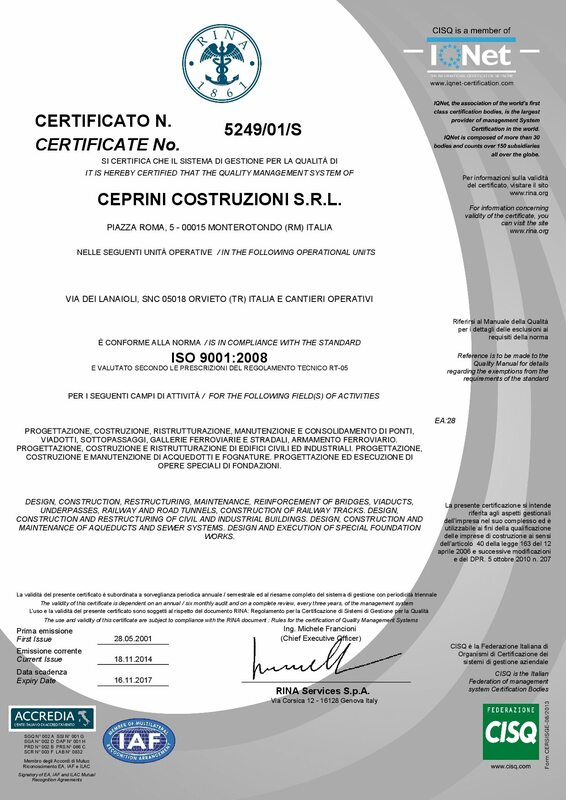 In 1973 he enrols the company at the Chamber of Commerce in Terni as individual company Ceprini Surveyor Franco. 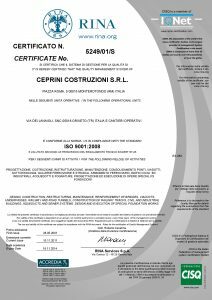 In 1974 he obtains a membership on the National Register of Builders as individual company specialised in roads and railway construction, river works and building construction. From 1977 he leads the company in a huge growth of volumes, manpower and vehicles. From 1992 to 1995 during the business sector crisis, with a significant turnover’s downturn, he maintains his company intact. And from 1995 the company has a huge expansion on the national territory, most of all in the mid-northern regions, specialised in underpasses run by oil hydraulic system, maintenance and tunnels construction, consolidations and road body and buildings maintenance. 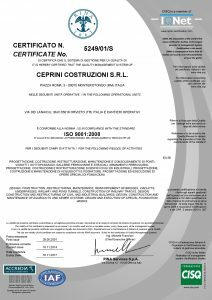 In 1999 it is among the first company in this sector, at national level, to obtain Quality System Certification UNI EN ISO 9002 and SOA Certification that has replaced the National Register of Builders. 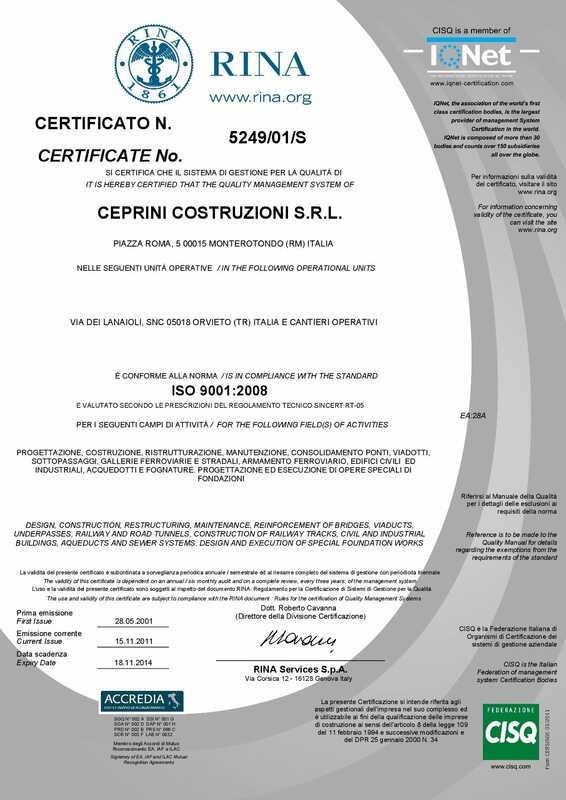 In 2001 he transforms the individual company CEPRINI FRANCO into CEPRINI COSTRUZIONI S.r.l. in charge of Sole Director and Technical Director. 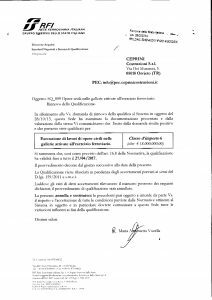 In 2010 a further transformation creates a Boards of Directors with Franco Ceprini as President and Technical Director and Patrizia Ceprini as Managing Director. 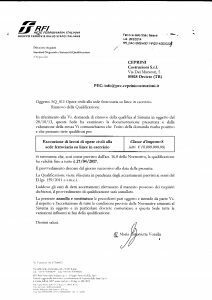 To cooperate with the Technical Direction has been appointed Ing. 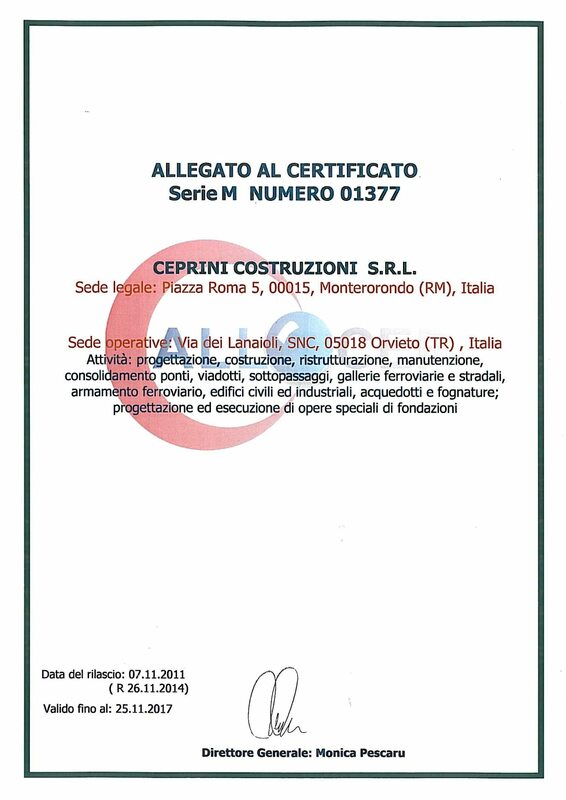 Vincenzo Spagnoli as second Technical Director, a highly considered professional from Orvieto, also in railway sector, for having realised many and huge works executed from Ceprini Costruzioni Srl in behalf of R.F.I (Italian Railways) S.p.A. 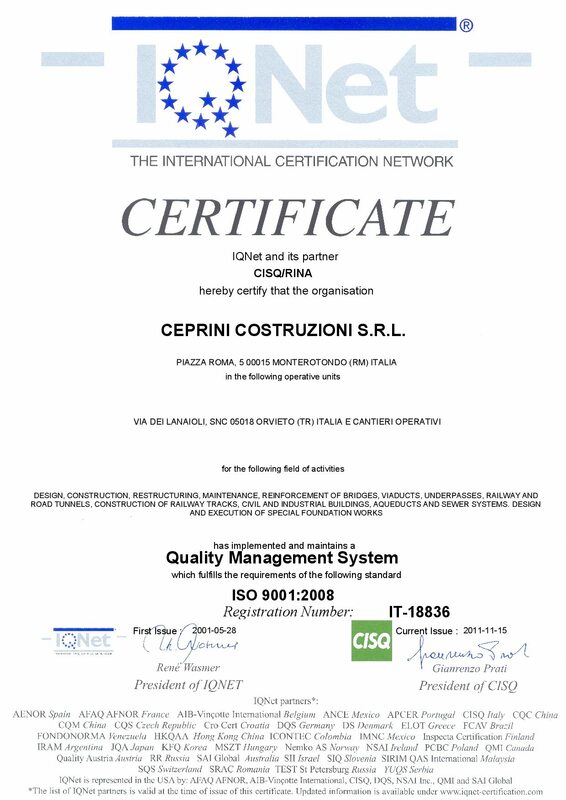 Thanks to the huge experience, organisation efficiency, forefront vehicles and a manpower of over 160 employees (average of last five years), the company differs in the ability to reduce the execution times of the works, working in different shift in 24 hours, depending from necessity and the site works execution. The company has a highly qualified and experienced staff, forefront and absolutely efficiency vehicles and equipment. 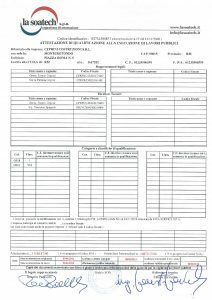 This permit to the company to face with excellent results difficult situations. 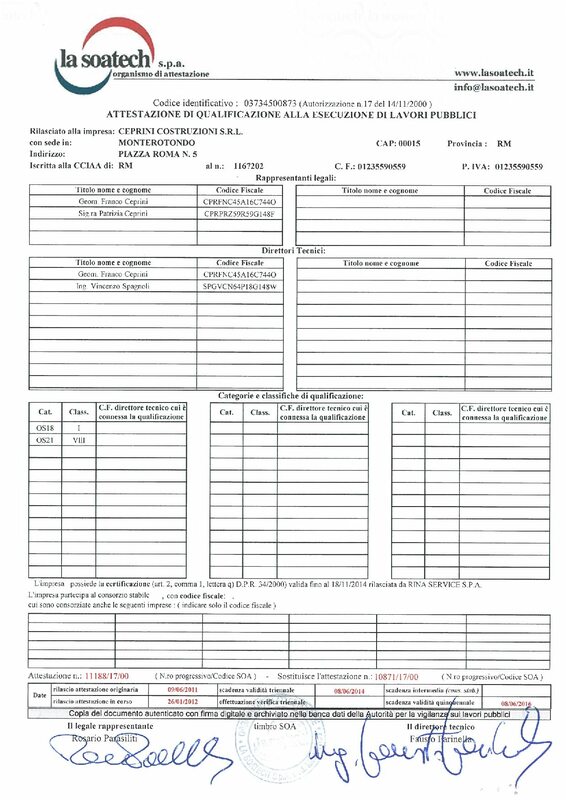 With a great experience, organizational efficiency and equipment it differs for the ability to reduce the execution times of the works, working also with more shifts in 24 hours, depending from necessity and the site works execution. These are divided in specific sector of activities. Every areas has a own person in charge that organizes the different sector activities and it is supported by external professionals that work permanently with the company. 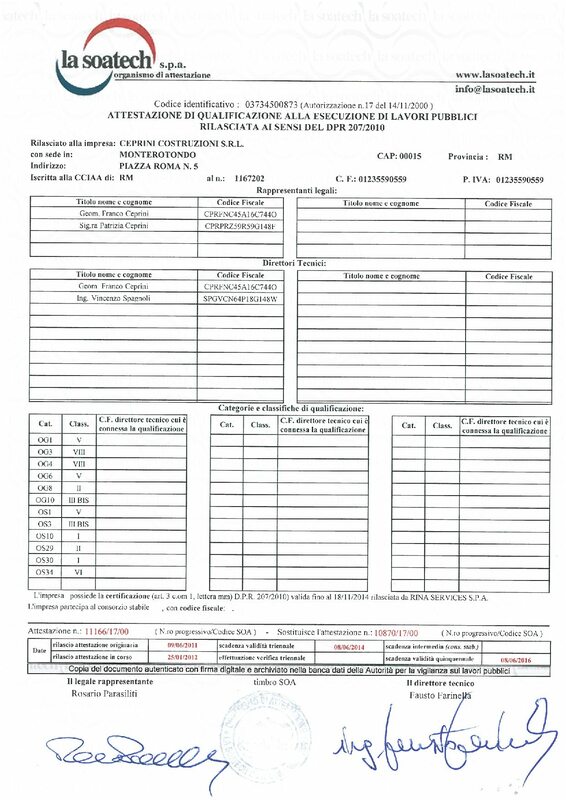 The administrative area makes use of external professionals for work and tax advice supported by studios with national and international importance. 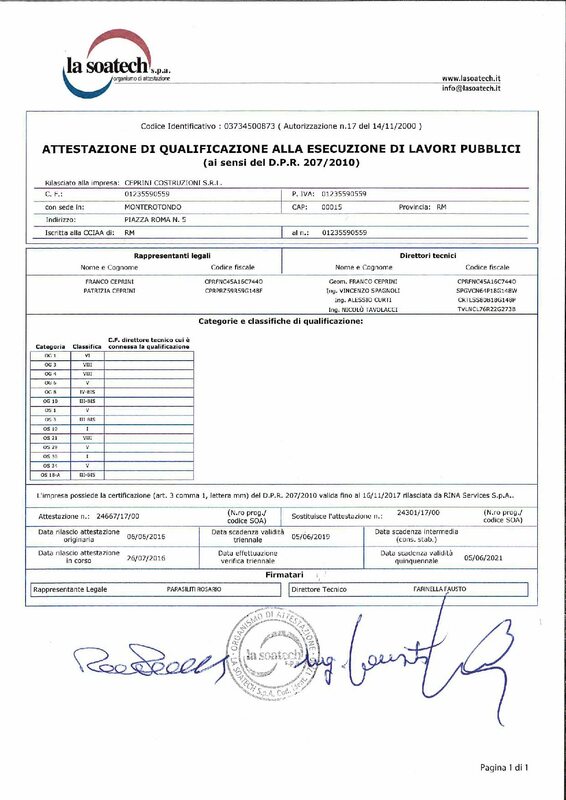 The technical area is supported by professional studies with national and international importance for planning advice, works’ static acceptance tests and for the management quality system, safety and environmental. The operational area is the hearth of the company. 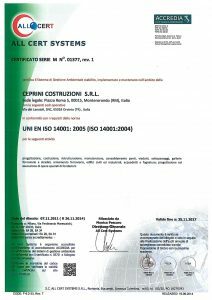 It has highly qualified and experienced employees, considering the workers and site’s technicians, and efficient and forefront vehicles and equipment. 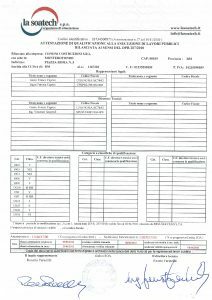 This permit to the company to face with excellent results difficult situations. 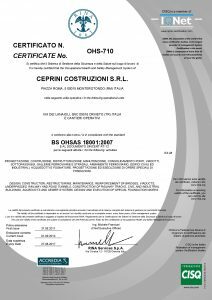 Particular attention is directed to safety and prevention, issues in which the company has always demonstrated great sensibility and commitment. 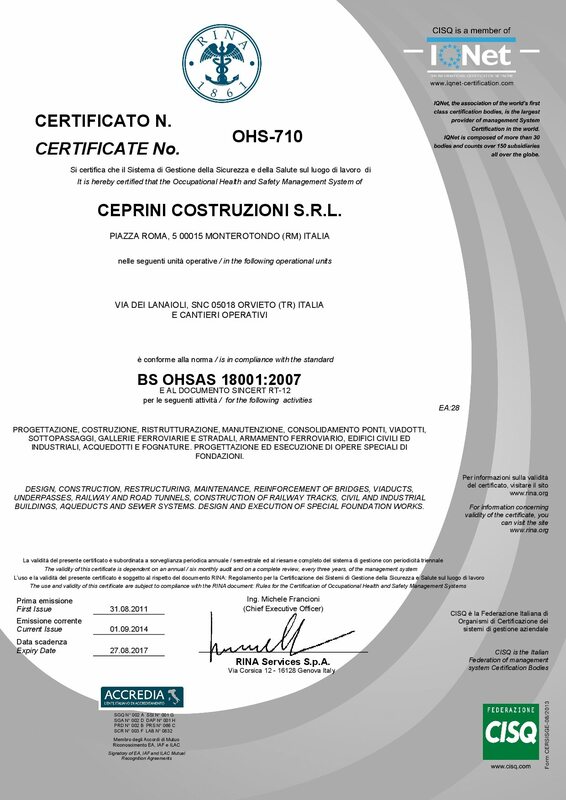 With a constant work of improvement, constant training information, workers and site’s technicians control, the company has a system of safety management that allows to reduce dangerous and risks situations for the activities. The persons in charge for Protection and Prevention Service are highly qualified-external individual according to strict current regulations in safety sector. 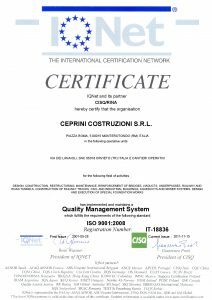 Ceprini Costruzioni Company is enrolled in different national and international certification bodies for either works execution or quality management system. 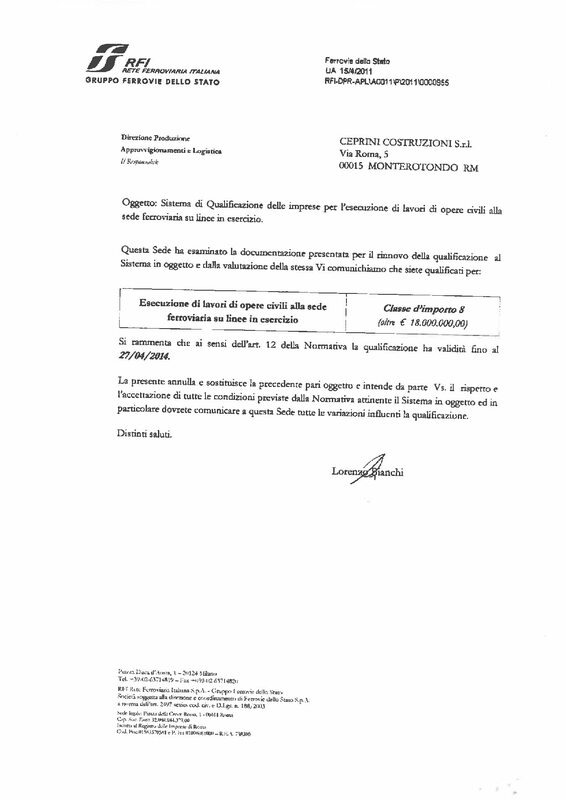 The company has SOA certification for the execution of public works boasting three unlimited specialization categories (OG3-OG4-OS21) and is also enrolled in qualification systems established by Italian Railways for the civil works’ execution, either road body or tunnel, even in presence of railway operation, for unlimited classification. 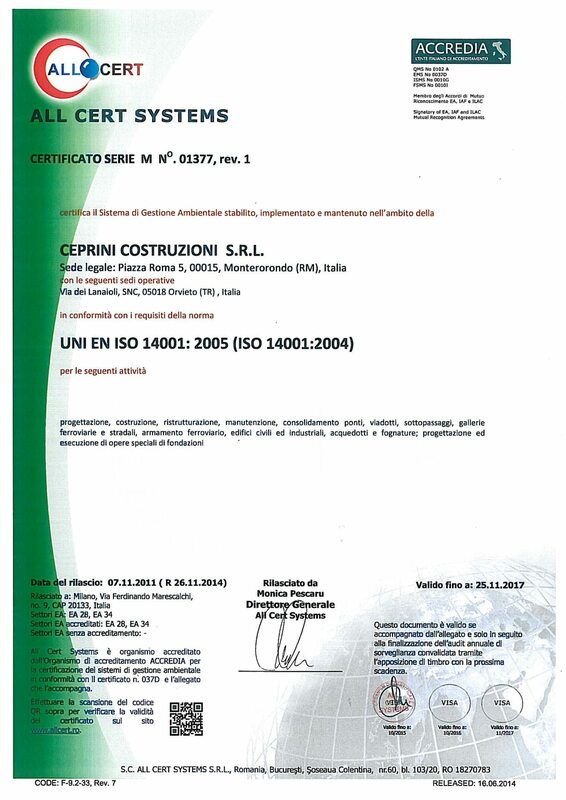 As concern the management of quality system Ceprini Costruzioni is in accordance with the regulations ISO 9001 (quality), BS OHSAS 18001(safety) and UNI ISO 14001 (environmental).